SCENE 15. Barry is feeling pretty grand when he shows up at a roadhouse on the way to Dublin. He plays the country squire, requesting a drink of water from the barmaid and paying her for it while never getting down from his horse. A pair of sketchy gentlemen in front of the roadhouse ask him to join them, but Barry’s got adventure on his mind and, it’s not too hard to imagine, sees himself as higher-class than the two seedy gentlemen. SCENE 16. Literally the next thing Barry knows, he’s being robbed by the two seedy gentlemen he met at the roadhouse, a Captain Feeny and his son Seamus. His dreams of adventure and social mobility are shattered after exactly one encounter with another person. Captain Feeny, who appears to be some sort of local celebrity gentleman bandit, smooths over the violation and violence of his encounter with Barry (he is robbed at gunpoint, after all) with flowery, gentlemanly rapport. He describes himself as a businessman, while those he robs are his clients. He’s the narrative in miniature, a thief who uses language to disguise the base purposes of his trade. 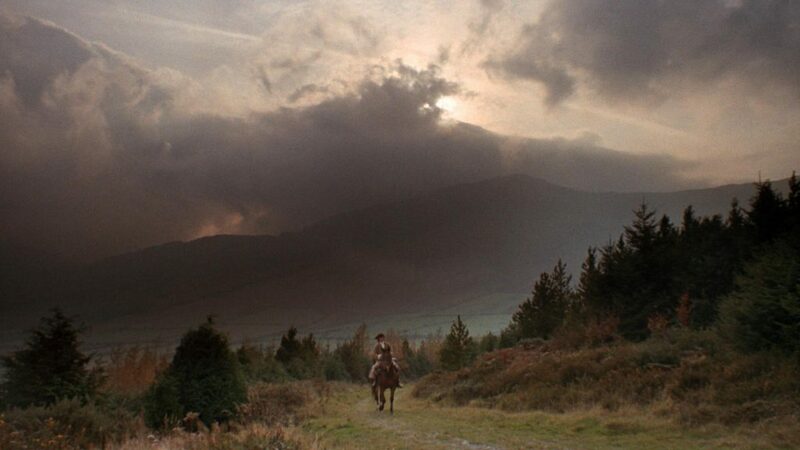 Barry Lyndon, both pictorially and narratively, uses the prettiest language possible to describe almost unspeakable cruelty and violence, both emotional and physical. If Barry learns something in his encounter with Feeny, it’s that language is not a tool of expression but a tool of concealment. SCENE 17. Barry now walks down a road, instead of riding. Even the small amount of money he had with him, not to mention his horse, saddle, pistols and sword, has all been taken from him. SCENE 18. 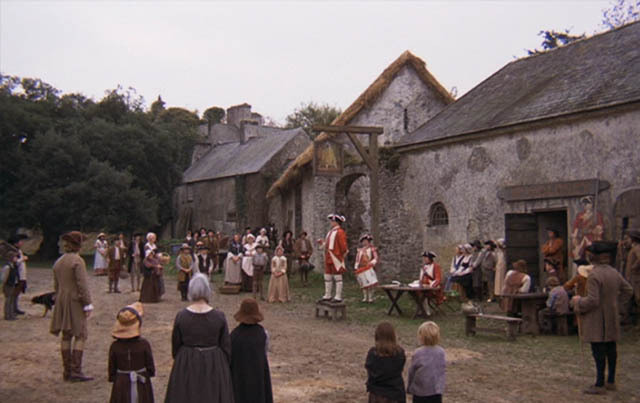 Barry arrives at a town where the British army — that is, the same organization who produced Captain Quin — is recruiting soldiers. The recruitment barker emphasizes the financial security of joining the army. Veterans, he tells us, are granted the princely pension of a shilling a day for the rest of their lives, on top of the guinea-and-a-half they get for enlisting and the fine clothes, weapons and, as the barker puts it, “accoutrements” of a soldier. To seal the deal, the barker explicitly mentions that the army is a chance to elevate a man’s social status. The barker has to say this out loud because Barry, being this peculiar Kubrick protagonist, has no scene of his own where he announces what he wants. The narrator tells us that he wants to raise his status, but Barry himself seems utterly static, blown by gusts of fate and geopolitical struggle. SCENE 19. So Barry is suddenly in the army, marching in formation, a cog in the grand machine of British imperialism. 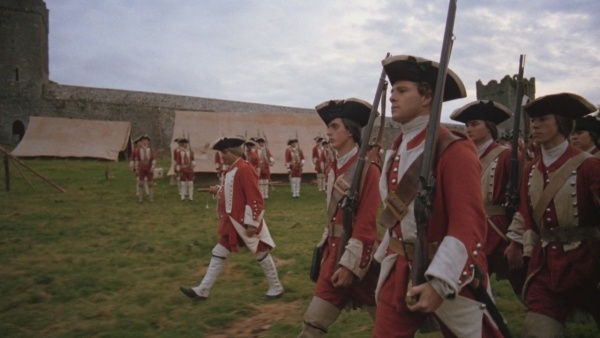 The narrator informs us that King George is “in too much need of men to heed from whence they came.” This will develop into a theme through the next two acts, as Barry falls lower and lower in status, and, as the war goes on, the armies of the Seven Years War become comprised of lower and lower characters. Toole’s mocking stings: Barry really does aspire to higher things, believes himself to be better than all this. And, perhaps, he is: he was, after all, while penniless, at least a member of a good family with a little property to their name. Barry taunts Toole right back, and Toole, a hulk, starts a fight. An officer steps in, not to stop the fight, but to schedule it properly: the army doesn’t mind violence (obviously), but form and decorum must be observed. SCENE 21. Barry fights Toole — and cleans his clock. He knocks him down a total of seven times. And so, finally, we see that Barry is not a total fraud: he actually knows how to do something well. Two things, actually: he knows how to fight and he knows how to shoot a gun. He’s great at both those things. We could even say that Barry is, in fact, a man of violence. As much as he aspires to class, he’s much more fit to kill. 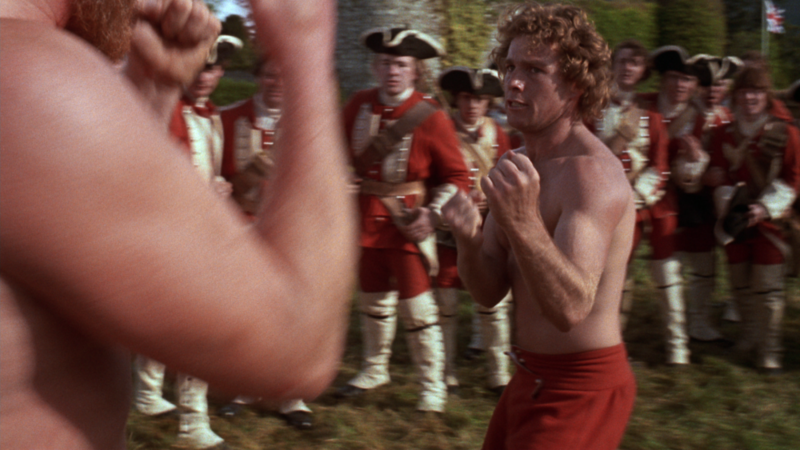 Everyone in Barry Lyndon is violent on some level or another, but Barry can actually use his fists. SCENE 22. As life in the army progresses and an invasion looms, armies coalesce and Captain Grogan, Barry’s second at his duel with Captain Quin, arrives, leading his own regiment. This prompts the first of two minor love stories that occupy Act II. Remember, as much as Barry desires social standing, he also desires love. We might say that he would have done quite well for himself if love had never entered his heart. But he sees Captain Grogan, Captain Grogan sees him, and their common bond warms both their hearts. 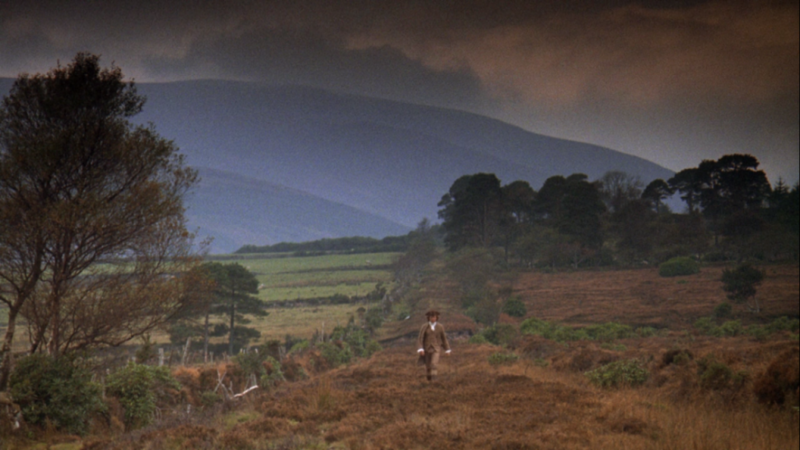 This motif, of running into a fellow countryman in the middle of a strange land, will get repeated later. SCENE 23. 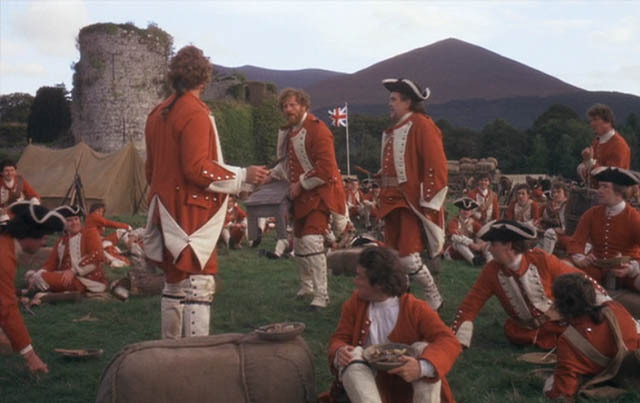 Captain Grogan meets with Barry in his tent. The thrust of the scene is that Grogan tells Barry that he has, in effect, been the victim of a con. The gun he used on Captain Quin, we learn, was filled with tow. The viewer will be forgiven if, like me in 1975, missed the rest of the scene because I was trying to figure out what “tow” was. Turns out, it’s a fiber related to hemp or flax, chaff if you will. So Barry shot Quin with a bundle of fiber. His cousins, the Bradys, had no intention of losing Quin’s 1500 pounds a year to the upstart Barry. So we see that Barry has won nothing — he never had a chance with Nora, he never had a chance to redeem his honor. Grogan tries to let Barry down easy by mentioning that he, himself, got 200 pounds for his part in the con, and that Barry can draw from it whenever he needs to. So, again, the themes of love, social status and violence continue their waltz: Nora got social status, the Bradys got social status, Quin was shot but that was only a deception, Quin got Nora’s love (whatever that means; Nora, we already know, is inconstant and deceptive her own self), Grogan got paid off, and Barry got nothing, but hey, while he’s suffering in the army he can get money from Grogan whenever he needs it. 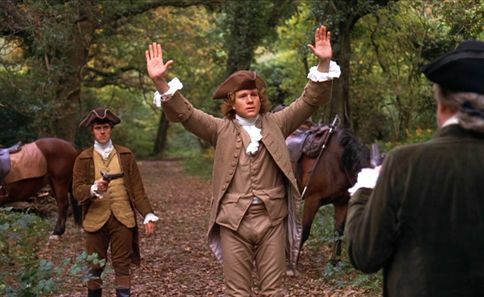 Those three qualities, love, social status and violence, endlessly recombine in Barry Lyndon until they finally wring every bit of life from the characters.